If you are a chocoholic, you’ll love the addition of either a homemade or good quality store-bought chocolate sauce to this banana coffee chai smoothie. However, if health or weight is a concern, you could skip the chocolate sauce and use skim milk and/or a sugar substitute to prepare your banana coffee chai smoothie, as I prefer to do with mine. Since gluten is not a concern in my diet, I have also added wheat germ to my banana coffee chai smoothie, which is a great source of both vitamin E and folic acid. Well, enjoy this healthy, refreshing, and delicious banana coffee chai smoothie!!! ** For a dairy-free version, use soy, rice, or coconut milk instead of regular milk. 1. Bring the water to a boil. Pour 1/4 cup water in a small mug and add the teabag. Let steep for 3 to 5 minutes or until the tea is strongly brewed. Squeeze out the teabag and discard it. Add the instant coffee to the remaining 1/4 hot water and stir. 2. Pour both the brewed tea and prepared coffee into a blender, and add the milk, banana, spices, sugar, and wheat germ if desired. Puree until smooth. Add the ice cubes and blend just until the ice is crushed. If desired, pour a bit of chocolate fudge into a glass and swirl. Then, pour smoothie into the glass, sprinkle with additional cinnamon or ginger if you wish. 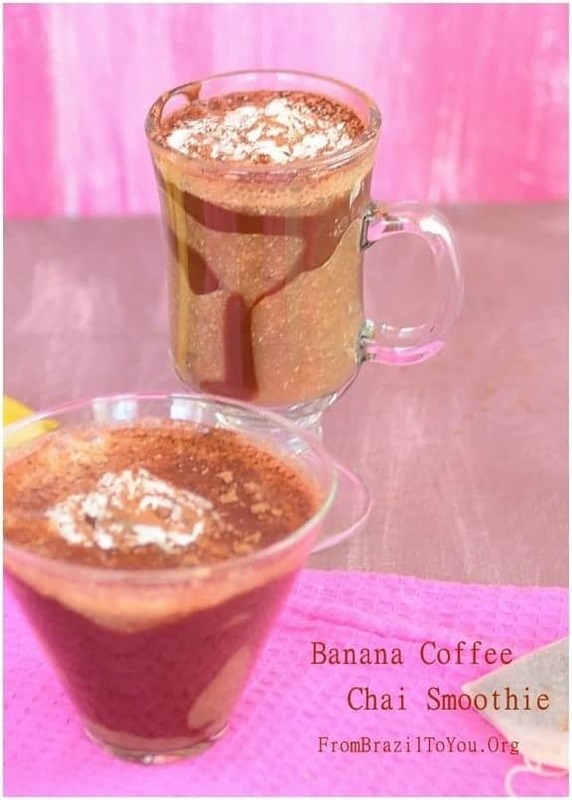 Enjoy Banana Coffee Chai Smoothie! Note: Recipe adapted from About.com Herbs and Spices. Yummy! Looks so good! My children love smoothies and we have one of those individual blender thingies and they all make their own. I will recommend these flavours to them. What a marvelous breakfast treat! 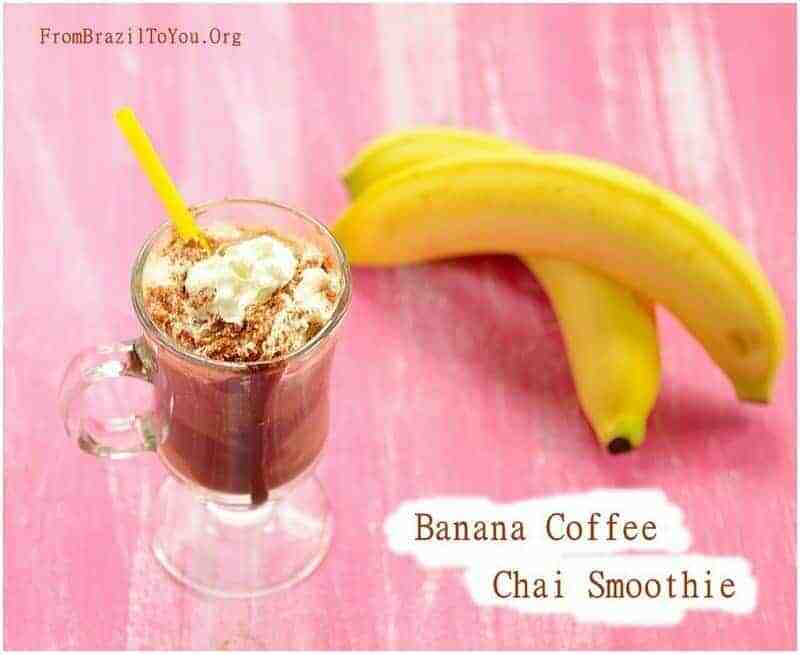 The pairing of banana with chai is irresistible! Thanks, Deb! I do agree with you: Chai and bananas pair very well. I have so many bananas right now, many of them too soft – might as well make this kind of smoothie. Thank you for the idea! It looks wonderful in that glass cup – I have the same one! I do also appreciate your visit. Wishing you a great week! Yum, your smoothie looks and sounds so delicious! Sounds like this drink has everything I like! We’re having warmer days here and this sounds like a perfect drink to enjoy the spring! Thanks, Nami! I hope you can try it.